Deep clean in half the time! 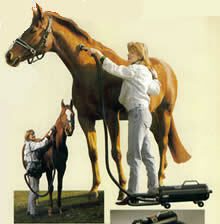 Large animal groomer... cleans deeper in half the time. It can move 135 cubic ft. of air per min. for fast, high-powered grooming. The Pro-3AG, Vac-N-Blo does all the work and cuts grooming time in half. 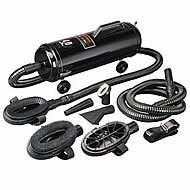 As a vacuum, its super suction gets down deep to remove parasites, dirt, dandruff, and loose hair. As a vacuum, its super suction gets down deep to remove parasites, dirt, dandruff, and loose hair. As a blower, it dries coats evenly and completely. Leaves hair smooth and lustrous. Removes 95% of the water from an animals coat. Can even be used to blow dust off animals. Portable and lightweight, can be used anywhere. Works great on large dogs, horses, donkeys, cows, even llamas love it. Adjustable shoulder strap frees hands for easy use. Excellent for cleaning debris from barn stables, grain drills, tractors, feed mills, etc. Built for continuous heavy-duty operation. Weighs 9.5 lbs. Comes complete with cloth bag, shoulder strap, 2-6' flex hoses with air flow control, air concentrator, air flare, groomer rake, 3 piece brush comb set, 3 disposable bags, 2 filters. - Triple filtration. Paper bag, permanent cloth and filter. - 100" of water lift. - Grounded power supply cord. - Two 6.5 foot flexible hoses with air flow control. - Air concentrator, air flare, and groomer rake. - 3 piece comb set (grooming, curry comb and pin comb brushes).